Have you ever gone out to a bar, gotten caught up in the good vibes and made some wild claims about activities you’d be great at? Well, that’s what happened to this poor guy who was hanging out at a local pub, spotted actor Jason Mamoa, better known as Khal Drogo from Game Of Thrones, and decided to challenge him to a game of slaps. As you can imagine, the results were not pretty. In fact, the back of his hands were left bruised, battered and humiliated in less than a minute. Luckily, however, the event was taped for the world’s collective amusement. As you can see in the above video, Mamoa is kind enough to let his new friend, referred to as Dustin, take the first shot, which he misses immediately. Afterwards, it’s Drogo’s turn to start firing right and left slaps, and his accuracy proves a little more impressive. In fact, the connected hits are so dead-on, they sound like Chris Benoit knife edge chops. It’s as if the stings are echoing through the entire bar, begging every single person to turn around and appreciate their precision and ill-intent. Some men would probably be embarrassed by how weak-kneeded Dustin looks in this video, but if our hero plays it off right, he’s going to have a great story to tell every single human being he knows. 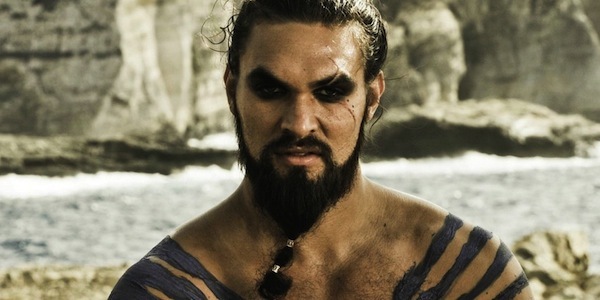 He looked Khal Drogo dead in the eyes and took the most aggressive punishment the game of slaps will allow, and while he didn't exactly behave like a man while absorbing his beating, he continued playing until the end. Job well done, Dustin. You took on this beast and lived to tell the tale.